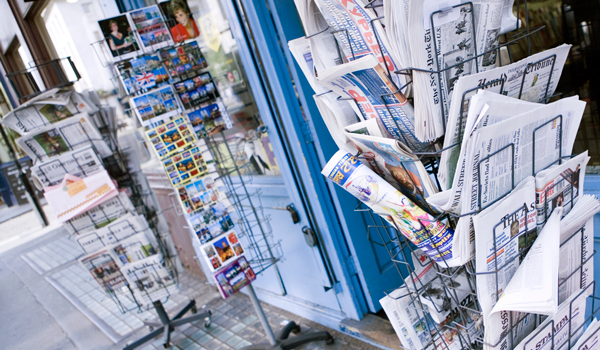 Historical newspaper content is among researchers’ most sought-after primary source material. With more than 60 premier stand-alone historical titles, ProQuest Historical Newspapers™ is the definitive newspaper digital archive empowering researchers to digitally travel back through centuries to become eyewitnesses to history. From leading issues and events, like the U.S. Civil War, immigration, westward expansion, industrial developments, race relations, and World War I and II; to international, local and regional politics, society, arts, culture, business, and sports, ProQuest Historical Newspapers™ reveals the day-to-day news coverage to researchers and historical explorers, providing invaluable insights and information to users from a wide range of subjects. Every issue of each title includes the complete paper, cover-to-cover, with full-page and article images in easily downloadable PDF format. Researchers can study the progression of issues over time through these historical newspaper pages, including articles, photos, advertisements, classified ads, obituaries, editorial cartoons, and so much more. 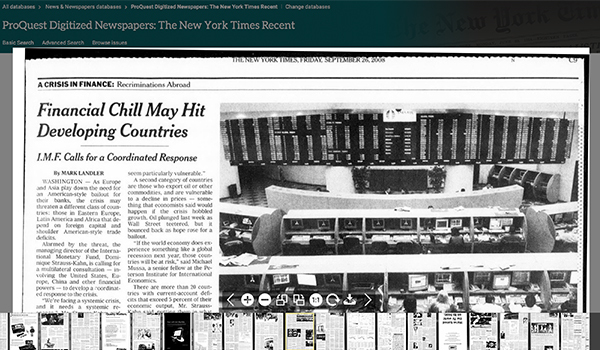 The ProQuest Historical Newspapers™ archive contains more than 55 million digitized pages. And now, ProQuest is pleased to announce the addition of Regional Collections to the Historical Newspapers portfolio. Six regional collections will be offered, with nearly 100 titles included across the six collections. 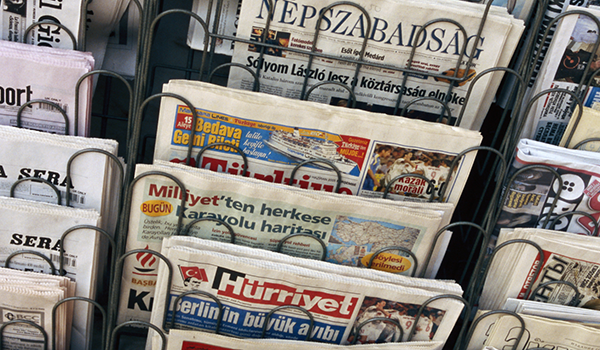 Researchers can study how local and regional papers reported on news of the day, concerning global, national and local issues, events and people. With ProQuest Historical Newspapers, researchers have access to full-runs and full-images that include front-page headlines, classified ads, marriage and death announcements, comic strips, reviews, display advertising, editorials, birth notices, photographs, and many other article types to not only understand the news of yesteryear, but more importantly, the context in which it was made. ProQuest makes it easy for both novice and experienced researchers to find relevant information quickly, with basic and advanced search options. Researchers searching ProQuest Historical Newspapers will benefit from robust information management and workflow tools and functionality integrated into the platform, like the ability to cite results in numerous citation styles, save as a PDF or other document formats, save searches, and export documents to reference management tools. 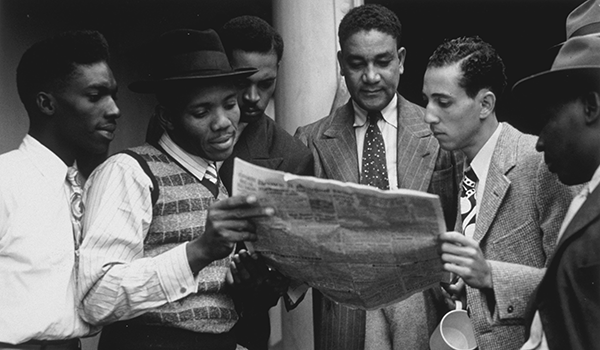 With ProQuest Historical Newspapers, follow news across time and across geography, uncovering the multiple perspectives surrounding important issues and events. ProQuest Historical Newspaper titles are fully cross-searchable with each other and all other databases located on the ProQuest platform, including ProQuest Recent Newspapers and all Newsstream news resources, improving breadth, depth and context. For many titles, stories that spanned multiple newspaper pages are threaded together, appearing as one continuous image and further improving readability. ProQuest Historical Newspapers is the definitive newspaper digital archive offering full-text and full-image articles for significant newspapers dating back to the 18th Century. Not all titles listed below are live. Each new title will load with the content we have, and remaining new titles will continue loading through 2020. There are gaps in years of coverage for some of these titles. Not all titles listed below are live. Content will load into new titles starting in 2019 and will continue through 2020.
International Newsstream provides the most recent news and extensive backfiles from outside of the U.S. and Canada. The comprehensive collection features over 800 newspapers, newswires, transcripts, and digital-only news sites in full-text format.